It was Pedel To The Metall, with Adan Banuelos aboard, for a 226-point win in the 12-horse finals of the Western Bloodstock NCHA Showdown in Cowtown on Sunday, July 12, during the NCHA Summer Cutting Spectacular. The win was worth $60,000 to the 4-year-old Metallic Cat son’s owner, Faith Mountain Ranch, Houston, Tex. Reyzin, shown by Phil Rapp for Gale Force Quarter Horses, placed second with 223 points, and Junie Wood, with John Mitchell for Slate River Ranch, was third with 221.5 points. Six-year-old Reyzin, by High Brow CD, earned $39,500; five-year-old Junie Wood, by Nitas Wood, earned $26,000. “He’s a real strong horse and has an insane amount of natural draw to him,” said Banuelos, who qualified for the finals with 222 points in the 59-horse go-round, held at Silverado Arena in Weatherford, Tex., and drew fourth to ride in the finals. Pedel To The Metall was bred by Gail Holmes’ Double Dove Ranch out of the Dual Rey daughter Twice As Reycy, reserve champion of the 2003 NCHA Futurity and third in the 2004 NCHA Derby. He is a three-quarter brother to Reycy Moon, the earner of $209,363, sired by Cats Moonshine. Wes Ashlock, Abilene, Tex., trained Pedel To The Metall as a two-year-old, then Holmes sent the colt to Banuelos in January 2014, in preparation for limited age event competition. 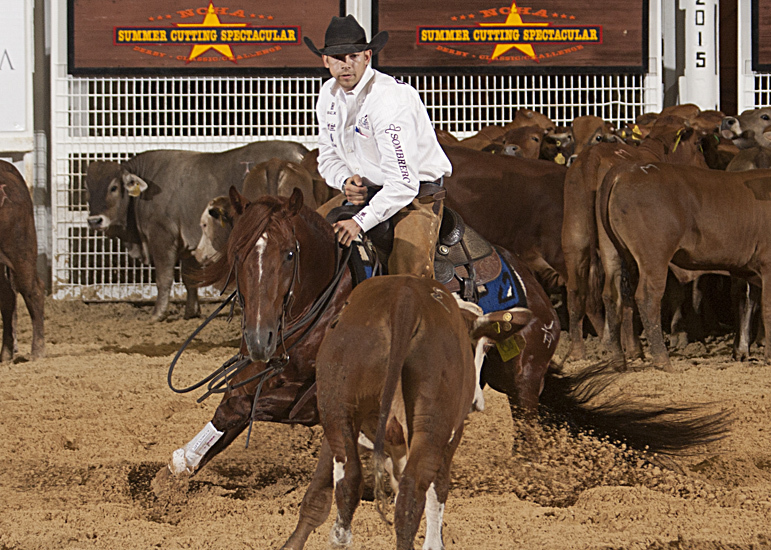 Banuelos and Pedel To The Metall qualified for the NCHA Futurity Semi-Finals, as well as for six major finals in 2015. The win was worth $60,000 to the 4-year-old Metallic Cat son’s owner, Faith Mountain Ranch, Houston, Tex. (the 2014 NCHA Derby winner’s payout during the Summer Spectacular was $35,457).